Vor wenigen Wochen auf der RingCon nutzten wir die Gelegenheit, zwei bezaubernden Damen aus den Niederlanden, deren Kostüme uns ein ums andere mal wieder umhauen, ein paar Fragen zum Thema Cosplay und Conventions zu stellen. Das Interview wurde auf Englisch geführt, weshalb ihr hier zuerst die englischsprachige Version findet. Die deutsche Übersetzung folgt direkt darunter. Vielen, vielen Dank an Anne und Anouck! und auf dem gemeinsamen Tumblr-Blog Tookish Cosplay ! Miss Geek: When and why did you guys start cosplaying? Anne: … yeah, that must have been like 8 years ago, but we didn’t start cosplaying ourselves until we started attending conventions. I think the first convention we attended was in 2010? And then 2 years later we really started making costumes and wearing them. Miss Geek: Which convention was that? Your first one? Anne: The first one was ChibiCon, which doesn’t even exist anymore. Anouck (laughing): ChibiCon! Oh, yes! Anne (laughing): It was a very small Convention in the Netherlands. It was an Anime Convention and it was kinda crappy. But, you know, you gotta start somewhere. Miss Geek: And what were your first Cosplays? Anouck (laughing): First actual Cosplays or first good Cosplays? Anne: We started cosplaying Hetalia, which is an Anime. Good times! Anouck: She was Canada, her first, and I was China. And she used that horrible wig and I used my own hair and, like, an army jacket that I bought because I thought it was cool. Anne: Some people start cosplaying and immediately they make great costumes and then they improve even more, but we weren’t the kind of people who start out making nice costumes. We started with crappy costumes. Anouck: But we had a lot of fun! Anne: The first costume I really sewed myself was Katara from Avatar – The last Airbender. That’s the first one I actually like. Anouck: For me it was Dîs, Thorins sister. Miss Geek: Is there such a thing as your favourite Cosplay? Or do you love them all equally? Anne: I do really love my Sansa costumes in particular, mostly because I really love the character which is why I have three different costumes of Sansa. I have a bit of a problem there (laughs). Anouck: For me it’s mostly the one I just finished, the most recent. So it changes, like … last week I finished my Marina and the Diamonds costume and I’m not very proud of how it looks, but I’m just very happy to finally finish it and wear it to a Convention. So it’s always the most recent, actually. Miss Geek: Being a Cosplayer you always get reactions from the people around you at Conventions. Is there a favourite memory? What was your favourite moment as a Cosplayer? Anouck: I think for me it was the first time someone said to me ‚Oh, I saw you online!‘. It was at HobbitCon. I was Dîs, my first self-made costume, and I had put it online on Tumblr and there were people who recognized me. I’ve never had that before. Anne: And every time we do get recognized from the internet, although it doesn’t happen very often, it’s like … (makes a disbelieving, surprised face). But what I also really like … I’ve cosplayed Anna from Frozen and then at some events when there are kids you get all the little kids running after you! One of my favourite memories is from a recent Convention when a small boy and a small girl walked past me and the boy was really excited and went ‚Annie!‘ and the sister went ‚ Hach! It’s A-N-N-A!‘. And then they both turned to me and were like ‚Can we have hugs?‘. It was really cute! MissGeek: Which Cosplay was the most challenging for you to do? Anouck: Well, challenging … I have one costume I spent a lot of money and time on and I never finished it. It was Bofur, and I spent around 300 € on it and it was never finished. I really want to do it, but I don’t think I’m at the right skill level right now, because I’m very picky. So, that’s one of the hardest costumes, but I’m gonna finish it eventually. Anne: Usually I just run into problems with each costume, they all have challenging part, but the Anna costume I mentioned earlier … I have been working on it for a year and a half on and off because I made different costumes in between, but I spent sooo much time on embroidery that by now it is really challenging to motivte myself and actually finish it after all this time. MissGeek: Do you actually identify with the characters you cosplay or do you choose them simply because you like the costume itself? Anouck: It’s a combination of both. Anne: It’s a combination of both, yeah. I don’t really cosplay from contemporary fiction, because usually they just wear regular clothes and it’s not that much fun to make. But that’s very important to me, if I’m going to spend that much money and time on it, that I really like the character. Anouck: Yeah, for me too. I’m always looking for something that is a bit challenging. Lately I did Shae and I really loved her character but mostly I did it because I really wanted to try embriodery and she had a bit of embroidery. It was an „easy“ dress – as in it wasn’t a lot of sewing. It was pretty easy to make, but a good way for me to try embroidery. Anne: I think if it’s a very challenging cosplay we need to like the character more. Anouck: Yeah, the more money I spend on it, the more I have to like the character. MissGeek: Do you have any future Cosplay plans? Except for Bofur. Anouck (lauhing): Well, Bofur, yeah, Which I’m gonna finish! One day. Anne: We’re actually planning on cosplaying characters from Firefly, which is actually kind of contemporary clothing, now that I think of it. 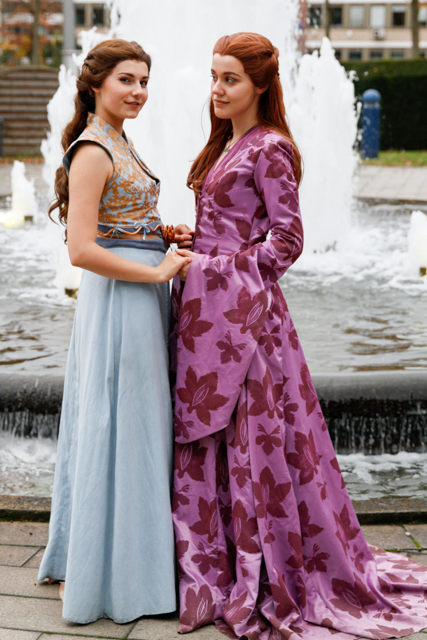 Anouck would be Inara and I would be Kaylee. Anouck: I’m gonna do some more historical dresses. I’m gonne make a 1920’s costume, like the flapper girls. I want to challenge myself to do more historical costumes. Miss Geek: That’s it, then! Thank you so much for the interview! Miss Geek: Wann und warum habt ihr mit dem cosplayen angefangen? Anne: Ja, das muss ungefähr 8 Jahre her sein, aber selbst haben wir erst mit cosplayen angefangen als wir unsere ersten Conventions besuchten. Ich glaube, wir besuchten unsere erste Con in 2010? Und zwei Jahre später haben wir dann wirklich damit angefangen, Kostüme selbst zu machen und zu tragen. Miss Geek: Und welche war eure erste Convention? Anne: Die erste war ChibiCon, die gibt es heute nicht einmal mehr. Anne (lachend): Das war eine sehr kleine Convention in den Niederlanden. Es war eine Anime Convention und die war ziemlich mies. Aber irgendwo muss man ja anfangen. Miss Geek: Und was waren eure ersten Cosplay? Anouck (laughing): Die wirklich ersten Cosplays oder die ersten guten Cosplays? Anne: Wir haben angefangen Hetalia zu cosplayen, das ist ein Anime. Das waren noch Zeiten! Anouck: Anne war Canada und ich war China. Anne hatte diese furchtbare Perücke und ich habe mit meinen eigenen Haaren gearbeitet und hatte irgendeine Armee-Jacke die ich gekauft habe, weil ich dachte das wäre cool. Anne: Manche Leute fangen mit cosplayen an und machen sofort großartige Kostüme, und dann werden sie einfach immer NOCH besser. Aber wir gehören nicht zu diesen Leuten, wir haben mit miesen Kostümen angefangen. Anouck: Aber wir hatten großen Spaß dabei! Anne: Das erste Kostüm, dass ich wirklich selbst genäht habe war Katara aus Avatar – Der Herr der Elemente. Das ist das erste Kostüm, das ich wirklich mag. Anouck: Für mich war das Dîs, Thorins Schwester. Miss Geek: Habt ihr denn ein Lieblingscosplay? Oder liebt ihr sie alle gleichermaßen? Anouck: Für mich ist das meistens das Kostüm, welches ich als letztes fertiggestellt habe. Das ändert sich also immer. Letzte Woche habe ich zum Beispiel mein Marina and the Diamonds-Kostüm fertiggestellt. Ich bin nicht übermäßig stolz darauf, aber dafür sehr glücklich, dass es endlich fertig ist und ich es auf Conventions anziehen kann. Es ist also wirklich immer das Neueste. Miss Geek: Als Cosplayer reagieren die Leute auf Conventions ja irgendwie auf euch. Habt ihr da eine Lieblingserinnerung? Was war euer schönster Moment als Cosplayer? Anouck: Ich glaube für mich ist das der Moment als zum ersten Mal jemand sagte ‚Oh, ich hab dich im Internet gesehen!‘. Das war auf der HobbitCon. Ich war als Dîs unterwegs, mein erstes selbtgemachtes Kostüm, und ich hatte vorher Fotos auf Tumblr hochgeladen und es gab tatsächlich Leute, die mich erkannt haben. Das ist mir vorher noch ne passiert! Anne: Und jedes mal wenn wir erkannt werden, auch wenn das nicht allzu oft passiert, ist das total …. (macht ein ungläubiges, überraschtes Gesicht). Aber was ich auch sehr mag … Ich habe Anna aus Die Eiskönigin gecosplayed und auf einem Event mit vielen Kindern rennen dir dann auf einmal alle hinterher! Eine meiner liebsten Erinnerungen ist von einer Convention, die wir erst vor kurzem besucht haben. Ein kleiner Junge und ein kleines Mädchen liefen an mir vorbei, der Junge war total aufgeregt und rief ‚Annie!‘ und seine Schwester sagte ‚Hach! Sie heißt A-N-N-A!‘ und dann drehten sich beide zu mir um und fragten, ob sie mich umarmen dürften. Das war total niedlich! MissGeek: Welches Cosplay war bisher das anspruchsvollste für euch? Anouck: Also, anspruchsvoll … Es gibt ein Kostüm, für das ich sehr viel Geld ausgegeben und Zeit investiert habe, und es ist nie fertig geworden. Das war Bofur und ich habe ungefähr 300€ investiert und es nie fertig gestellt. Ich will das wirklich noch machen, aber ich glaube momentan reichen meine Fähigkeiten dazu noch nicht aus, ich bin da sehr pingelig. Das ist eins der schwierigsten Kostüme, aber irgendwann werde ich damit fertig! Anne: Normalerweise habe ich mit jedem Kostüm ein anderes Problem, alle haben schwierige Teile. Aber das Anna-Kostüm, das ich vorher erwähnt habe, an dem habe ich anderthalb Jahre lang gearbeitet, weil ich zwischendurch noch andere Kostüme gemacht habe. Aber ich habe sooo lange an den Stickereien gesessen, dass es gerade sehr schwierig ist mich zu motivieren und das Kostüm nach all der Zeit wirklich fertig zu stellen. MissGeek: Könnt ihr euch mit den Figuren die ihr cosplayed wirklich identifizieren, oder wählt ihr sie einfach aus, weil euch die Kostüme gefallen? Anouck: Eine Kombination aus beidem. Anne: Ja, eine Kombination aus beidem. Ich cosplaye nichts Zeitgenössisches, da die Figuren meistens ganz normale Kleidung tragen, da macht das Herstellen nicht so viel Spaß. Aber für mich ist es sehr wichtig, dass ich, wenn ich so viel Geld und Zeit in ein Kostüm investiere, die Figur auch wirklich mag. Anouck: Ja, für mich auch. Ich suche immer nach kleinen Herausvorderungen. Vor kurzem habe ich ein Shae-Kostüm gemacht. Ich mochte die Figur wirklich, aber ich habe das hauptsächlich gemacht, weil ich Sticken einmal ausprobieren wollte und auf ihrem Kleid gab es kleine Stickereien. Es war ein „einfaches“ Kleid, also ich musste nicht viel nähen. Es war sehr einfach herzustellen, aber eine gute Gelegenheit für mich, das Sticken mal auszuprobieren. Anne: Ich glaube, wenn das Kostüm sehr schwierig ist, dann müssen wir die Figur schon mehr mögen. Anouck: Ja, je mehr Geld ich ausgebe, desto mehr muss ich die Figur mögen. MissGeek: Habt ihr irgendwelche zukünftigen Cosplaypläne? Außer Bofur. Anouck (lachend): Ohja, Bofur. Das wird schon noch fertig, eines Tages. Anne: Wir planen Figuren aus Firefly zu cosplayen, was irgendwie schon zeitgenössisch ist, wenn ich drüber nachdenke. 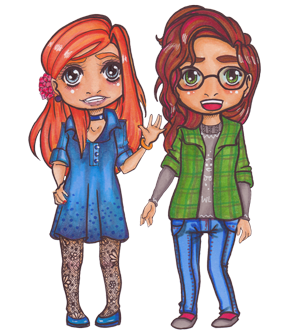 Anouck macht Inara und ich Kaylee. Anouck: Ich werde mehr historische Kleider machen. Ich will ein Kostüm aus den 20er Jahren machen, so wie die Flapper Girls. Ich will mich der Herausforderung stellen, mehr historische Kostüme herzustellen. MissGeek: Das wars dann auch schon! Vielen Dank für das Interview!